Since 1996 we have inventoried and studied the biodiversity in the surroundings of Callas (France, Var) and have been logging the butterflies of our region. Above all, our attention was drawn to their biology and lifecycle. We were curious to understand more about what linked certain species to a specific habitat, and why others were declining in number, and distribution. We were equally interested in the dynamics of populations with regard to the impact, and the role played by parasitoids, which for millions of years have evolved closely with their hosts: usually the eggs, caterpillars and chrysalises of different butterflies. 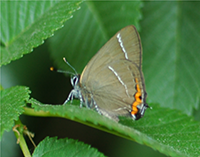 In 2006 we began filming the behaviour and biology of butterflies in our region, in particular the vulnerable ones. We observed the interdependence between ants and caterpillars of different species of Lycaenidae. Our documentaries show the various stages of development of the species in their natural habitat. Caterpillars were sometimes placed in captivity, so that we could better observe their behaviour. Once emerged, the butterflies were released back into the wild. Through our articles and films we invite you to discover the complexity of these intricate relationships and the struggle for survival of these butterflies and parasitoids.